CAOS Conflict Management provides leadership coaching for leaders who are having difficulty in managing the inevitable conflicts that arise from being in a senior role within their organisation. We have considerable experience in mediating and providing conflict coaching in workplace difficulties involving team members, managers and senior staff. Our Leadership Coaching draws upon principles and philosophies of effective communication that support creative conflict resolution. These principles and philosophies have developed out of, and are informed by, the experience of mediating working relationship and communication breakdowns in a wide range of workplaces including businesses, community organisations and public sector organisations such as local authorities and universities. Conflict always provides an opportunity for learning, change and growth and for any organisation being able to make full use of this 'natural resource' to enhance the performance of systems and staff is a way of remaining effective and competitive within its area of operation. Leaders of any organisation need to be able to respond effectively to conflict at both a personal and professional level. Personal, because to struggle at this level with the inevitable conflict that will arise for anyone in a leadership role will mean their professional role and effectiveness can be compromised. Professional because being able to use conflict as an opportunity for your organisation to learn and evolve in the face of any challenge is essential if it is to remain relevant and useful to your clients, and even to be a pioneering organisation in your field of activity. Our leadership coaching will give you a reflective, confidential 'safe space' to discuss the challenges faced in responding effectively to conflicts that arise for you whether at a personal level or a professional level. Click here to listen to a podcast of an article Alan Sharland wrote for TD the American Society for Training and Development magazine (now called the Association for Talent Development ATD) called Conflict as an Opportunity. For example, at a personal level you may find it difficult to engage with a colleague over a particular issue because one or both of you are starting to use abusive or offensive language towards each other, dismissing ideas with personal comments rather than focusing on the strategic and systemic effectiveness of the idea. This inevitably gets in the way of a constructive discussion as well as undermining trust in a future working relationship. Leadership coaching will help you to use communication responses that enable the discussion to remain constructive and creative even if your colleague communicates in ways that you feel are inappropriate. Bullying can often be a topic that arises in the form of accusations towards leaders with regard to their style and personality. Leadership Coaching can enable you to have a 'non-defensive' discussion and exploration of any situation where you have been accused of an 'aggressive' or 'bullying' leadership style to help you remain assertive while removing the features of your approach that are described in this way. At this level you may be having difficulties with partner organisations or leaders of other teams or even your clients and may want to improve that professional relationship because you have concerns about the impact on these relationships of any developing conflict situations. Your leadership coaching can help you reflect on what you want from the working relationship with those organisations and how you can optimise your opportunities for continuing that working relationship. "Our traditional views of leaders - as special people who set the direction, make the key decisions, and energize the troops - are deeply rooted in an individualistic and nonsystemic world view. Especially in the West, leaders are heroes - great men (and occasionally women) who 'rise to the fore' in times of crises. Our prevailing leadership myths are still captured by the image of the captain of the cavalry leading the charge to rescue the settlers from the attacking Indians. So long as such myths prevail, they reinforce a focus on short-term events and charismatic heroes rather than on systemic forces and collective learning. At its heart, the traditional view of leadership is based on assumptions of people's powerlessness, their lack of personal vision and inability to master the forces of change, deficits which can be remedied only by a few great leaders. The new view of leadership in learning organisations centres on subtler and more important tasks. In a learning organisation, leaders are designers, stewards and teachers. They are responsible for building organisations where people continually expand their capabilities to understand complexity, clarify vision, and improve shared mental models - that is, they are responsible for learning." Our leadership coaching will enable you to treat all conflict as an opportunity for learning rather than a hindrance or inconvenience for day-to-day operations or as an 'obstacle' to the driving forward of change. We can come to your place of work or other preferred location or we can have sessions via Skype or other online facility. 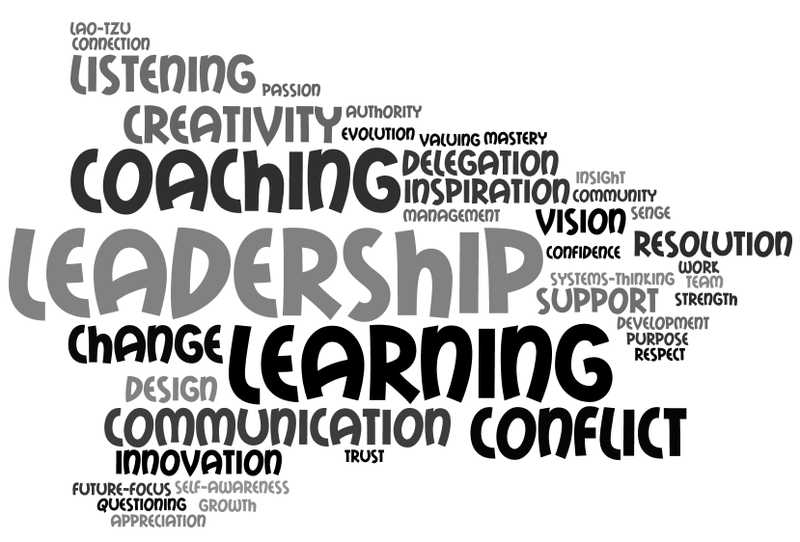 We would normally recommend a 90 minute session for all Leadership Coaching sessions. 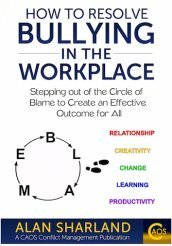 "Alan Sharland has written a vital book on bullying. His approach is the way forward. Instead of focusing on 'proving it', which takes us in the direction of investigations and hearings that go no where and only serve to exacerbate an already sensitive situation, he shows the way forward through direct communication and a focus on the behavior that is of concern. At times the support of an internal workplace mediator will help." Click on the image above or Click Here to purchase this book on Amazon.